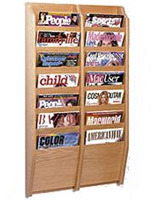 An Array of Publications Can be Stored! 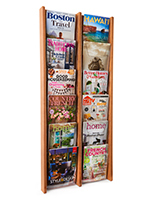 Literature is Displayed at Eye Level! 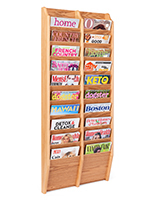 Slotted Design Keeps Titles Visible! 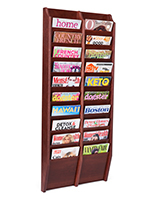 This professional wall literature rack, magazine holder, is vertically stacked to dispense newsletters while saving floor and desktop space in a showroom or office! 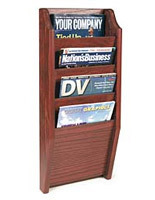 This mounted fixture for business showcases company literature in a beautiful wooden display! 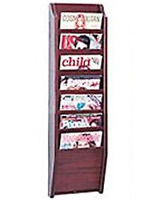 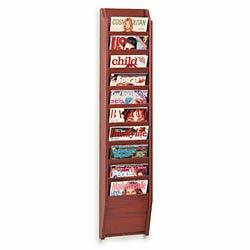 This professional wall literature rack for organizing periodicals is wall mounted securely. 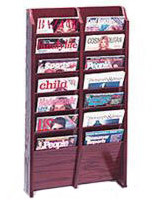 This ten pocket system has a decorative mahogany finish that will not be surpassed visually! 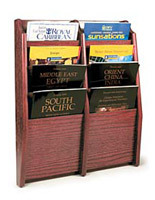 This professional wall literature rack that is a wooden chart holders stand dispenses reading material to visitors and clients while they wait!